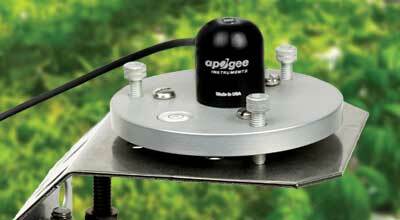 Apogee Instruments' ultraviolet (UV) sensor provides a cost effective measurement of UV radiation. The patented domed shaped sensor head facilitates runoff of dew and rain, helping to keep the detector clean and minimizing errors caused by dust blocking the radiation path. Sensors are housed in a rugged anodized aluminum body and electronics are fully potted. Applications include: UV radiation measurement in outdoor environments (sensor is not recommended for long-term continuous outdoor deployment), laboratory use with artificial light sources (e.g., germicidal lamps), and monitoring the filtering ability and stability of various materials. Analog and digital output options are available. Analog version is an un-amplified voltage output. Digital outputs include USB and hand-held meter. Digital "smart" USB sensor uses USB communication and custom software to interface directly to a computer. Hand-held meter has a digital readout and is available with a sensor integrated into the top of the meter or attached via cable. Calibration factors for photon flux density units [µmol m-2 s-1] and energy flux density [W m-2] are provided with each sensor allowing for rapid unit conversions. Pigtail-lead sensors feature an IP68, marine-grade stainless-steel cable connector approximately 30 cm from the head to simplify sensor removal for maintenance and recalibration. Cable and shielded, twisted-pair wire with a TPR jacket for high water resistance, UV stability, and flexibility in cold conditions.